City Connects’ work in Springfield Public Schools (SPS) was featured in the Spring 2012 issue [pdf] of the Springfield Educator. The conclusion of this school year marks the first year of City Connects’ implementation in six transformation (Level 4) SPS elementary schools. Next year, three SPS Level 4 middle schools will also be implementing City Connects. The article comes on the heels of the first-ever gathering of community partners working with SPS, held on May 9. Convened at Springfield College, a partner with SPS and City Connects, the meeting marked the official launch of the Springfield “Wraparound Zone” Initiative. Wraparound Zones are an effort funded through the state’s Race to the Top grant designed to build district capacity to systematically address students’ non-academic barriers to learning. 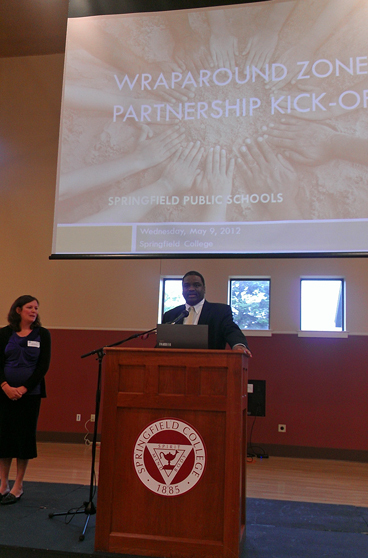 Julie Donovan and Dr. Ingram at the Springfield Public Schools Wraparound Zone launch May 9. Julie Donovan, the City Connects Program Manager in Springfield, welcomed more than 85 community partners to the meeting. Dr. Alan Ingram, Superintendent of Springfield Public Schools, opened the day by discussing the importance of the connection between home and school. “Twenty-six thousand students in our schools live in poverty. Morally, we can’t ignore it. Poor children can do well in school with the right supports,” Dr. Ingram said. Students only spend a small part of their day in the classroom, he said, so we can’t turn around schools by only looking inside the classroom. The solution is to bring fragmented parts of the community together to work on behalf of children.